As Game of Thrones approaches its eighth and final season, HBO and Thrones creator George R. R. Martin announced that, while the series may come to a close at the final battle, there are a lot more stories set in its imaginative world waiting to be told. Multiple spin-offs have been discussed, with five moving to the development stage, and one of those, a prequel, has officially been given the greenlight. What will this Game of Thrones prequel be about? Although it may not grace our screens for awhile, speculation and news surrounding its cast, plot, and release date are already running rampant and sending fans into theorizing mode. Below, find every detail that's been announced so far about the upcoming prequel. Hollywood screenwriter Jane Goldman (Kingsman: The Secret Service, X-Men: First Class) is signed on to write the series. Goldman will server as a showrunner and executive producer, working alongside Vince Gerardis who co-executive produced the original series, Daniel Zelman (Damages, Bloodline), Jim Danger (Orange Is the New Black), James Farrell, SJ Clarkson, Chris Symes (The Alienist) as a co-executive producer, and, of course, George R. R. Martin. Clarkson (Jessica Jones, Orange is the New Black) is also tapped to direct the pilot. Goldman created the premise for the prequel with Martin, drawing from the author’s existing text with Goldman penning the screenplay. In speaking to IGN, she explained the importance of wanting to utilize what already existed in the history of the GoT universe and expand on a specific moment in the forthcoming series. Of the focus of the prequel she said, "I think as a book reader or as someone who watched the series, you would say, 'Oh, that! OK.' Yeah, it would be recognizable as a past event." According to Deadline, the show is set to chronicle a period thousands of years before the happenings of GoT known as the Age of Heroes and its descent into a much darker period. 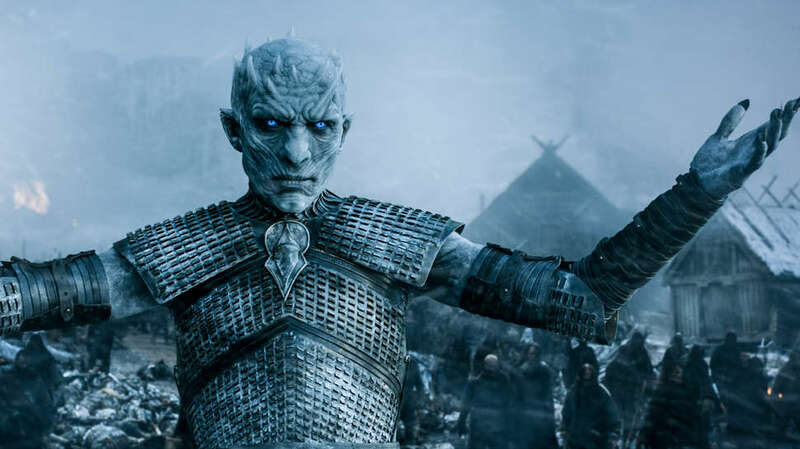 Taking place earlier in time, it'll alter fans' ideas of what they believed to be true about the origins of the White Walkers and Westeros' past. That may not be as detailed of a plot description as one would like, but it does place us in a somewhat less generalized time and place than hearing it won't be a prequel/sequel featuring the characters we know and love. You may have to say goodbye to the classic Thrones cast, but now you get to say hello to Hollywood A-lister Naomi Watts, who Deadline announced will lead the ensemble series. She is said to play a socialite with a dark secret -- vague, but very intriguing! Like GoT, the spinoff will feature a large ensemble cast. Shortly after news of Watts' casting, Deadline reported that British actor Josh Whitehouse (Northern Soul, The Happy Worker) would also appear. And as of January 2018, The Hollywood Reporter announced a number of other cast regulars, including Naomi Ackie (also in the forthcoming Star Wars), Denise Gough (Colette), Jamie Campbell Bower (Fantastic Beasts: The Crimes of Grindelwald), Ivanno Jeremiah (Black Mirror), Georgie Henley (The Chronicles of Narnia), Alex Sharp (How to Talk to Girls at Parties), and Toby Regbo (Fantastic Beasts: The Crimes of Grindelwald). Who they're playing, we've yet to find out. On a personal blog post, George R. R. Martin casually slipped that the forthcoming series would be called The Long Night when he shared the news that Naomi Watts joined the cast. It wasn't long after he hit publish, though, that HBO must have come knocking because he shared in a later post that the title actually isn't set in stone. He wrote, "HBO has informed me that the Jane Goldman pilot is not (yet) titled THE LONG NIGHT. That's is certainly the title I prefer, but for the moment the pilot is still officially UNTITLED." Everyone makes mistakes, including George R. R. Martin. But luckily, when he accidentally announced what the maybe/maybe-not-confirmed title is, he inadvertently revealed what events the prequel could chronicle. As GameSpot pointed out, the Age of Heroes was 8,000 years before GoT and disrupted by a painfully brutal winter that ravaged kingdoms -- what is known as The Long Night -- and grew even more destructive when the White Walkers arrived for the first time to Westeros. But eventually, they were defeated once an unknown figure called the Last Hero joined forces with the Children of the Forest to see their demise. Will the darker period that’s said to be coming in the series be The Long Night? And could Watts' character's secret be that she is the Last Hero? At this point, it's impossible to say, as this is all just speculation of what the Goodman-written show might cover -- but the events do lineup in the vague description of the plot, so at least a mention of this moment could be expected. Don't get too excited about the prequel yet, because it might not arrive for a while. Right now, HBO is focused on building excitement for the final season of GoT in advance of its release date in April 2018, and given that the series has yet to start filming, a 2020 debut seems like the earliest possibility. HBO president of programming Casey Bloys, at a Television Critics Association panel in 2017, said, "The number one priority in all of this is the final season of Game of Thrones... I don't want to do anything with a spinoff or anything that detracts or distracts from that." Fans of Thrones are no strangers to waiting, though, so you can hold out for a bit longer. But in the meantime, check back for more updates as they're announced.